Growing Another Side Hustle - Pet Sitting! Growing Another Side Hustle – Pet Sitting! I’ve started to feel stagnant in the last few months. Usually that means that I need to tackle something new (as you’ll see below). Right now, I think that means growing my pet sitting side hustle/hobby job! I’ve mentioned these before, but I thought you would appreciate the list again if you missed it. I’ve been working in one way or another since middle school. Pawn reseller during late high school ($15-$60 per ring) – I would buy rings from the “new and crazy” arena of online auctions in 1998 (like Bidz) and resell those rings to the local pawn shops. Dorm 24-hour help desk ($6 an hour) – I actually met Mr. BFS at this job one late night when I pulled him over to keep me company. Found out later that he kept walking by since he was trying to think of something to say, lol. He’s lucky I am social and get bored easily, hahaha. University of Houston donation center caller ($6.50 an hour and it sucked for 2.5 months before I quit) – I don’t know how many people hung up on me while saying that they worked for Enron and couldn’t afford anything, much less donations. University of Houston Games Room Attendant ($6.25 an hour and I did it for 3 years) – This was AWESOME. Made some great friends and am just super lucky to have ever gotten this position so I could leave the donation center. University of Houston Admin Office Assistant ($6.25 an hour for 2.5 years at the same time I worked the Games Room) – This was a great filler position, especially during the summers. Black Jack Dealer for Company Parties ($11 an hour but travel time didn’t count..overlapped with my last year of college) – I worked a bunch of company and private parties throughout Houston. It wasn’t as fun as real gambling but it was a great Friday and Saturday night job throughout my last year of school and first couple of years after graduation. Tax Office Receptionist ($7 an hour) – This one overlapped with the Games Room and the Black Jack Dealing for my last semester of college…had 12 hours of classes and 60+ hours of part-time jobs, lol. Forms programmer ($26,500-$35,500 a year over 6 years) – That job was pointless but I met a handful of amazing people, and the free time there did lead me to find out about blogging. So yay! Baby Sitting on and off ($10 an hour for two kids) – This lasted for about 6 days in one month. Then the kids started acting out since their mom left so often to be with her boyfriend. Baby Sitting ($20 an hour for three kids) – This was for a full weekend. I’m looking forward to continuing. Blogging and Blog Advertising Management ($100,000+ per year now) – This is by far the best job that I’ve ever had. It fits with my leap frog brain activity and lets me have the flexibility to actually live. The money is nice but the real benefits aren’t monetary. It’s nice to have a job that just finally fits me and not the other way around. As you saw, I’ve been a pet sitter and baby sitter on and off for more than 15 years. I posted a classified ad on our home owner’s association (HOA) website last August. It’s been so long that I nearly forgot. But I received a call last Thursday to check in once a day with two new, super cute dogs in the neighborhood for a couple of months. Woot! That gave me the inspiration I needed to tackle pet sitting all out. 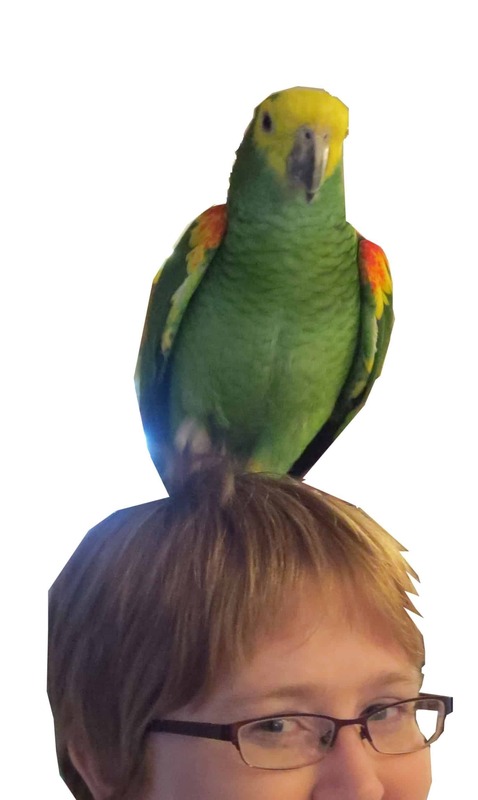 I updated my HOA website ad, added a cool picture of me and my mom’s parrot (Penny), and then listed myself on Craigslist too. That’s where I found pet sitting jobs a few years ago. Welcome to Crystal’s Cozy Care Pet Sitting! I’m self-employed and available during the day or night for pet-sitting in Northwest Houston, Spring, the Woodlands, etc. – I’ve taken care of dozens of dogs through volunteer work and pet sitting. – We have our own dog, an 11 year old Pug. – We were just forced to say goodbye to our 15 year old Dachshund that we had for nearly 9 years. – We fostered Pugs for 1.5 years before we adopted ours. – I regularly pet sit two other Dachshunds and one cat. – I’m adding two Shiba Inu pups to my upcoming schedule. – In the past, I’ve watched over a variety of birds, dogs, cats, hamsters, rabbits, and guinea pigs. The largest has been a 140 pound Mastiff. The smallest was a finch. I can visit your home 1-3 times a day as needed. If you would prefer to drop off your pet at my home instead, we can work out those details too on a case by case basis. I cannot accept cats in my own home thanks to allergies. My rates would depend on the circumstances of the job for which you need me. In general, it would be $15-$20 per visit depending on how many animals are in the home. Please call between 10am-10pm or email me anytime with questions or to schedule a meeting. Thanks! I posted that ad Friday night and received my first call Sunday morning. I’ll be taking care of two boxers this Tuesday-Thursday, whoo-hoo!!! I love it when my ideas start working quickly. But, I want to make sure that I am communicating well to as many people who see the ad as possible. If you were just browsing Craigslist for pet sitting ideas, what else would you need to see before you’d contact me? What would you suggest adding or taking out? What do you think about my new site? All suggestions are greatly appreciated! Pet sitting seems like it is a great side job for you. Just make sure that you are set up legally (LLC) or you have some kind of insurance. You need protection if you were to be sued if a dog was hurt/died in your care. Wow sounds awesome Crystal! Sounds like a fun side job as well. That sounds like a great fit for you! @Christie, flyers would work. And Craigslist (that was what my post was for that I shared). I chose my rates as an average of what I saw available on Craigslist. I’m not the most expensive or the cheapest. Good luck! That sounds like a great side job. Pets are much better to deal with than people in many cases. I’d make sure pets were current on vaccines before you bring them into your house if you didn’t think of that one already. That is such a cute parrot, sigh. You should take one with Dexter, some bearded dragons, a couple chickens, a cute cockatiel, with an aquarium behind and Penney sitting on your head, with maybe a cute lil puppy nearby. I wonder where you could take a photo like that…let me think. Lol. I’d be Leary of letting a stranger in my home off Craig’s list. I guess I’d want some personal recommendations and or proof of a clean criminal record. I used to pet and house-sit in college. 100% of my gigs came through word of mouth or from other jobs. I got some of my jobs (tutoring, house sitting) from my some of my regular customers back when I was a waitress. @retired, LOL, yeah, we’ll do that next time. @First Gen, great ideas! I’ll get references on the record and get a copy of my clean criminal record. I am hoping for word of mouth from these Boxers and the Shiba Inu’s. Word of mouth is the best way to grow when it’s personal like pets.